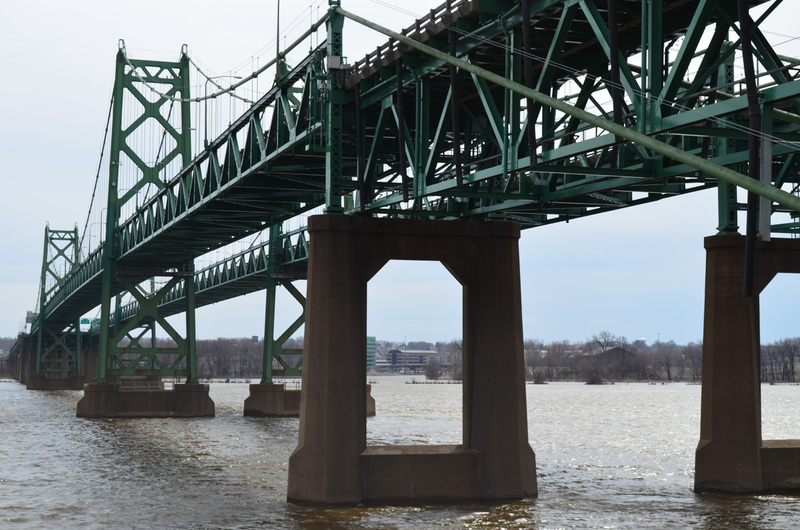 The Iowa-Illinois Memorial Bridge carries Interstate 74 across the Mississippi River. The westbound span was opened in 1935 with two-way traffic. The eastbound span was added by 1959.1 The suspension bridge carried U.S. 6 prior to the designation of I-74, which was added to the span once the freeway approaches were constructed in 1974.2 Tolls were collected at the crossing until January 1, 1970. Photo taken 04/06/13. Interstate 74, a diagonal (northwest to southeast) freeway, serves the Upper Midwest, Southern Great Lakes and Ohio River Valley area. Beginning in Iowa at a trumpet interchange with I-80 in the Quad Cities, I-74 leads southward between Davenport and Bettendorf to cross the Mississippi River into Moline, Illinois. 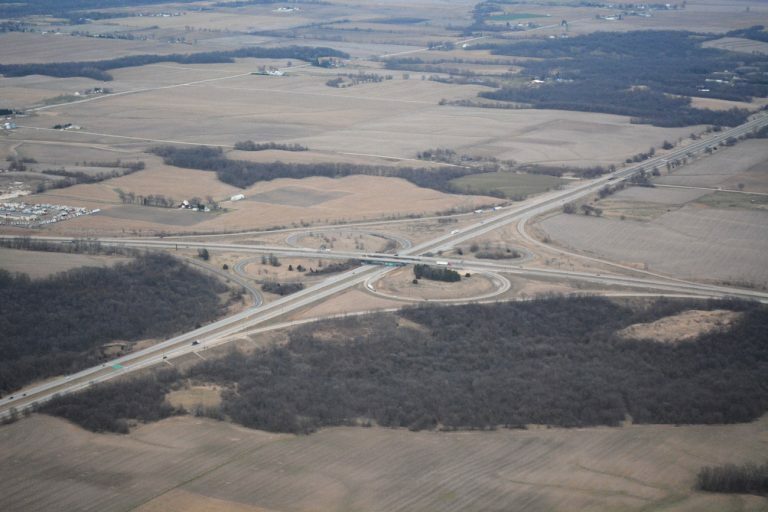 Turning east along side Interstate 280 at Quad City International Airport (MLI), I-74 meets Interstate 80 again at the Big X, a cloverleaf interchange near Colona. Both routes use off-ramps as mainlines there, with Interstate 74 leading south toward Galesburg. Aerial view of the Big X interchange, where Interstates 74, 80 and 280 and Illinois 110 (Chicago Kansas City Expressway) come together. Photo taken 03/11/17. Once at Galesburg, Interstate 74 turns southeast toward Peoria, where it crosses the Murray Baker Bridge over the Illinois River. Interstate 474 provides a bypass to the south while I-74 serves Downtown Peoria and East Peoria. Just east of the city is the north end of Interstate 155 and the village of Morton. I-155 provides cut off south to I-55 for Springfield and St. Louis while I-74 remains eastward to Normal and Bloomington. 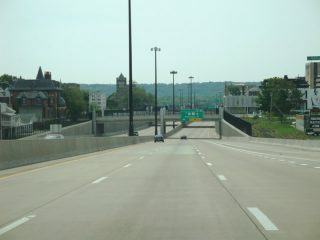 Interstate 74 eastbound at Downtown Peoria. Photo taken 05/24/18. A nearly six mile overlap takes Interstate 74 south along side I-55 around the Bloomington-Normal area. Interstate 39 ties into the area just east of the overlap while Business Loop I-55 lines an old alignment of Historic U.S. 66 through the cities. I-74 branches southeast to Champaign and Urbana while I-55 turns southwest to Lincoln. Interstates 57 and 74 come together at a full cloverleaf interchange on the northwest side of Champaign. I-57 follows a mostly rural route north toward Kankakee and Chicago and south to Effingham and Mt. Vernon. 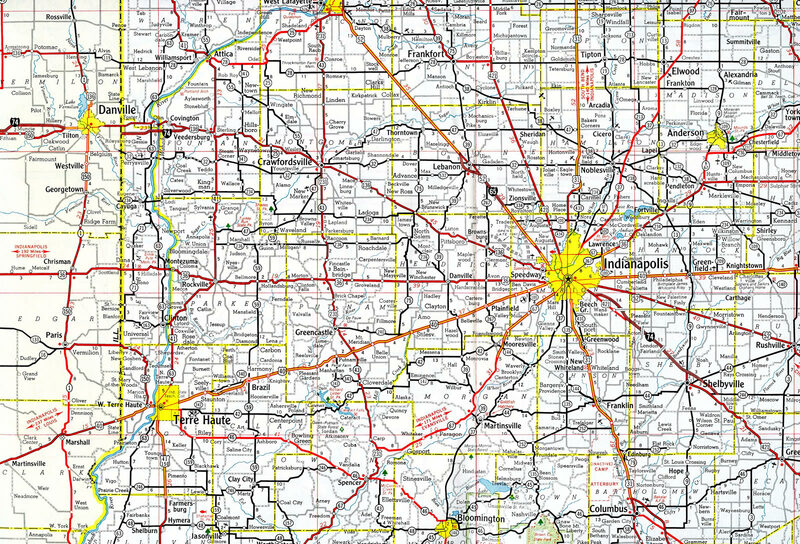 The route connects drivers along I-74 with adjacent Interstate 72, as it leads west from Champaign to Decatur and Springfield. Interstate 74 otherwise runs across northern reaches of the Champaign-Urbana area and then to Danville and the Indiana state line. U.S. 136 parallels Interstate 74 east from Danville to Crawfordsville and its eastern terminus in Indianapolis. Within the Hoosier State, I-74 sees long exit less stretches and mostly agricultural scenery outside of the Crossroads of America, the nickname of the capital city. 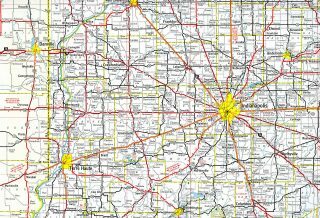 Within Indianapolis and Marion County, a Unigov system formed in 1970, Interstate 74 joins Interstate 465 to travel across the city. Freeway spurs at both connections with the beltway alluded to a continuation, but any plans to take I-74 through the city were dropped early during the Interstate system development. Additionally the west spur joining I-74 with Crawfordsville Road was removed during Accelerate 465 construction between 2007 and 2012. Beyond Interstate 465, I-74 resumes in a southeasterly heading to Shelbyville, Greensbury, where U.S. 421 leaves the corridor for Versailles, and Morris. The rural freeway reaches a hilly area at the state line where U.S. 52 overlaps into Harrison, Ohio. The stretch of Interstate 74 through the Buckeye State is punctuated by forested hills and suburban tracts as the freeway winds eastward toward Cincinnati. A short overlap takes the route along the I-275 beltway by Miamitown and across the Great Miami River ahead of the final push into Cincinnati at Mt. Airy Forest. I-74 concludes at the mix of U.S. 27, U.S. 52, U.S. 127 and Interstate 75 by the South Cumminsville neighborhood and Mill Creek in the city. Three extant sections of Interstate 74 also exist in North Carolina, but they do not connect directly with the existing I-74 from the Quad Cities to Cincinnati. They are from the Virginia state line along I-77 to Mt. Airy, from I-40 in Winston-Salem south to Ellerbe along I-73 and from east of Laurinburg to south of Lumberton along U.S. 74. Three other segments are signed as Future Interstate 74. They are from Mt. Airy south to Winston-Salem along U.S. 52, the Rockingham bypass and the Laurinburg bypass east to Maxton, both along U.S. 74. North Carolina’s section of Interstate 74 is part of High Priority Corridor 5: I-73/74 North-South Corridor. Its designation in North Carolina is written into law. Starting in the Quad Cities area, Interstate 74 follows U.S. 150 southeast to Danville, then follows U.S. 136 the rest of the way into Indianapolis. Southeast of Indianapolis, Interstate 74 at first follows U.S. 421, then U.S. 52 the final distance into Cincinnati. Illinois and Iowa have joined for the I-74 Corridor Study in the Quad Cities area. 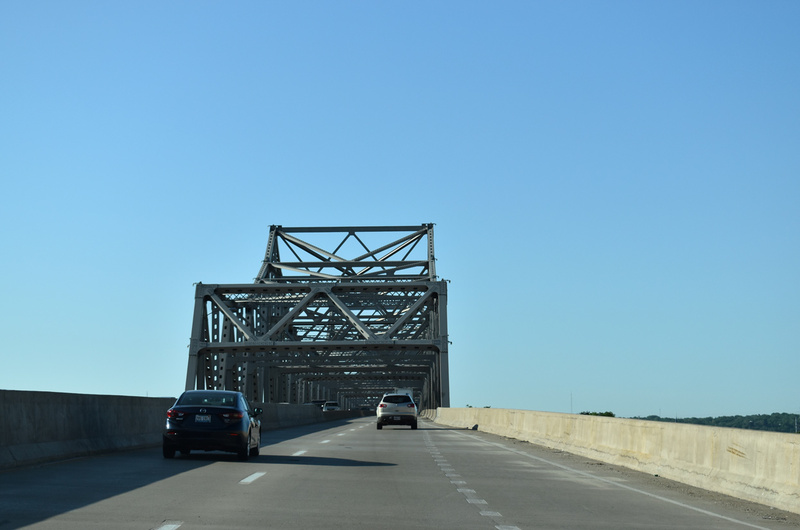 Improvements underway include work to expand I-74 throughout the Quad Cities, interchange modifications, and a new Mississippi River bridge. Significant funds for the study were included in the SAFETEA-LU bill, signed into law in August 2005. Interstate 74 through southwestern Ohio was completed in 1974. The easternmost stretch is undergoing redesign as part of the I-75 Mill Creek Expressway mega project. $13.1 million in construction was completed at the Colerain Avenue and Beekman Street (U.S. 27) interchange from May to September 2012. Additional work, including building a new westbound ramp from I-75 north, started in March 2015. New flyovers will be built on the north side of the exchange with I-75 as well and the Interstate 74 mainline will be rebuilt from Beekman Street east to the viaduct over Mill Creek and the adjacent railroad lines. See the Middle South Board layout for the final design. Construction runs through 2020. Interstate 74 through Peoria was reconstructed to modern standards between 2002 and fall 2007. The $500 million work affected 11 miles of roads. Photo taken 05/27/08. Construction of Interstate 74 northward from I-280 to the Iowa-Illinois Memorial Bridge replaced the route of U.S. 6 & 150 along 19th-27th Streets north to Downtown Moline. U.S. 6 was later shifted to the freeway northward to Kimberly Road while U.S. 150 was truncated southward from Moline to its intersection with U.S. 6 east of Quad City International Airport (MLI) in 1977. The earliest sections of Interstate 74 opened to traffic across the Hoosier State included a bypass of U.S. 136 south of Covington and upgrades to U.S. 421 from southeast of Indianapolis to Shelbyville. 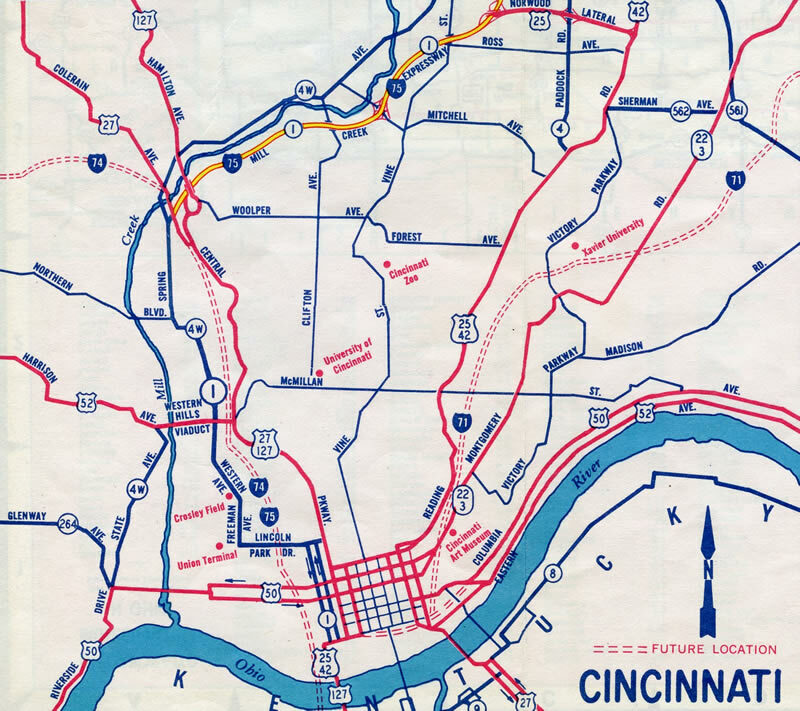 The Mill Creek Expressway for Interstate 75 was already open to traffic from U.S. 27 and the future east end of I-74 northward in 1961. Maps showed I-74 and I-75 overlapped south into Downtown. This may have been planned, as maps for Cleveland also showed I-71 & 77 concurrent to the Lake Erie waterfront. Within Illinois, Interstate 74 was completed initially through Peoria along the Illini Expressway and Murray Baker Bridge in December 1958. The cross-state route was finished in 1971 with the opening of I-74 between Bloomington and Mahomet.6,7 See the AARoads guide for Interstate 74 Illinois for more details on the original construction of the freeway. Crossing the Illinois River on the Murray Baker Bridge linking Peoria with East Peoria. Photo taken 05/24/18. The Big X cloverleaf interchange where Interstates 74 and 80 bump one another utilizes a TOTSO (turn off to stay on) movement for both freeway mainlines. In an effort to correct this design issue, Illinois officials proposed renumbering the Quad Cities Interstate system in 1991 to reroute I-80 south over I-280 around Moline and Rock Island and I-74 north over current I-80 from East Moline to Le Claire and north Davenport. 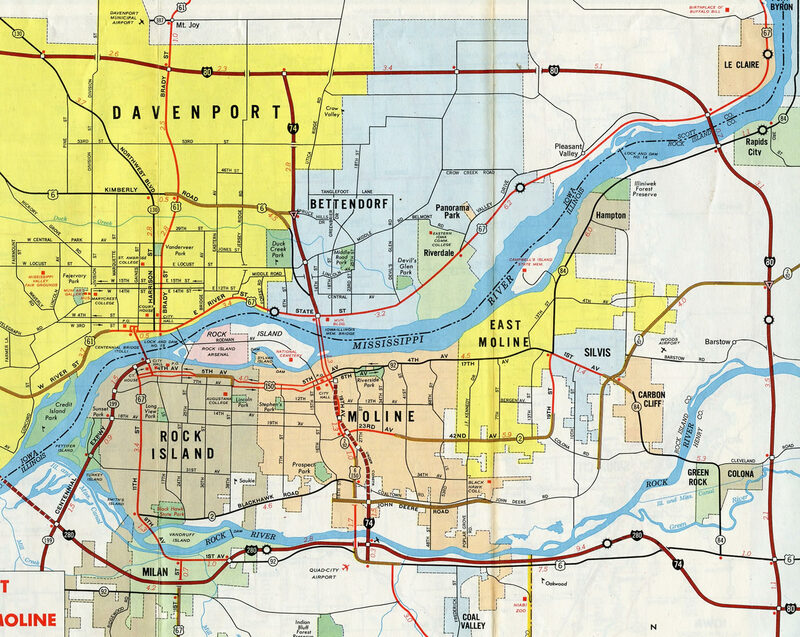 The existing I-74 between Moline and Bettendorf would be renumbered as Interstate 174. This action was not supported by Iowa officials and officially dropped in 1993. 2003 – Reconstrucing overpasses for Sterling Avenue, Gale Avenue, University Street, Broadway Street, Sheridan Road and Ellis Street. 2003 – Construct a new intersection at Knoxville and Pennsylvania Avenues, reconstruct Downtown Streets and permanently remove the Bigelow Street, Columbia Terrace and Armstrong Street bridges. 2004 – Reconstruct over and underpasses for Nebraska Avenue, Perry Avenue, Monroe Street, Madison Street, Jefferson Avenue, Adams Street and Washington Street. 2004 – Reconstruct University Street ramps and eastbound Washington Street ramps in East Peoria. 2005 – Close Murray Maker Bridge and raise Adams Street over I-74 by another 15 feet. 2005 – Widen War Memorial Drive and replace ramps. 2005 – Widen Main Street in East Peoria, reconstruct Washington Street westbound ramps. The I-74 and I-155 Improvement Project underway between spring 2013 and fall 2016 rebuilds the freeway and interchange at Morton, Illinois. I-74 was reconstructed and expanded to six lanes from just east of I-474 to Morton Avenue (Exit 102). I-155 was upgraded from I-74 south to Illinois 98 (Birchwood Avenue). The trumpet interchange joining the two freeways was expanded to improve ramp geometry. The single lane tunnels taking Jefferson Street under I-74 were replaced with a conventional overpass while the adjacent abandoned railroad underpass was removed. The interchange with Morton Avenue was also redesigned to eliminate the Exit 102B loop ramp on I-74 eastbound. Accelerate 465 construction finished in December 2012 rebuilt an 11-mile corridor of the Indianapolis beltway along the west side of the city. The $423 million project included a redesign of the full cloverleaf interchange joining Interstates 74 and 465 with Crawfordsville Road (former U.S. 136). The direct connection from I-74 to Crawfordsville Road was removed and replaced with new ramps joining it and the beltway with U.S. 136 just to the south. This eliminated weaving traffic patterns and the TOTSO connection for the Interstate 74 westbound mainline. Long range plans called for Interstate 74 to continue east and south of Cincinnati through West Virginia and Virginia into North Carolina and South Carolina, with the freeway ending in Myrtle Beach. However, only North Carolina has shown interest or made progress with building I-74. 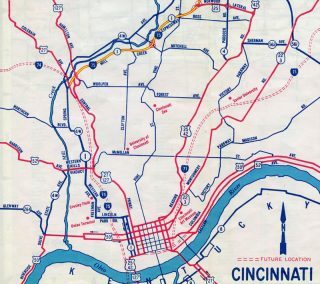 Ohio and West Virginia are unlikely to ever build their proposed portions of the route. To make the connection between Cincinnati and Huntington, West Virginia, Interstate 74 was proposed to pass through either Ohio or Kentucky. A feasibility study of routing Northern Kentucky Outer Loop Interstate 74 http://transportation.ky.gov/planning/projects/projects/I-74/I-74.shtm in Kentucky was completed in March 2003, and it revealed that constructing an east-west bypass around Cincinnati to the south via Kentucky might be needed someday, but it was not necessary at the time. Another study at the time considered routing Interstate 74 along the AA Highway rather than Ohio 32. In West Virginia, Interstate 74 was programmed to follow proposed Interstate 73 along U.S. 52; the two routes would split before entering Virginia, with Interstate 74 merging with Interstate 77 south into North Carolina. Interstate 74 shields were first erected along a stretch of U.S. 220 freeway south of Asheboro, North Carolina and in 2000 along a stretch between the Virginia State Line and Mt. Airy, North Carolina. See Interstate 74 in North Carolina and High Priority Corridor 5 for more information and photos. In South Carolina, a failed state resolution previously attempted to designate the Carolina Bays Parkway as part of Interstate 74, the Veterans Highway/Conway Bypass as part of Interstate 73, and the North Myrtle Beach Connector from Main Street to the parkway as part of a new route called Interstate 174. The route of I-74 now is proposed to hook southwest from Wilmington, North Carolina to reach the Grand Strand via the Carolina Bays Parkway. I-73 may be built as a toll road but funding has continually remained an issue. The North Myrtle Beach Connector was completed as an at-grade expressway and opened in September 2009. For more on I-73 in the Carolinas, visit Bob Malme’s Interstate 73/74 Progress web pages. Interstate 75 (Mill Creek Expressway) winds southwest between Mill Creek and the Clifton neighborhood of Cincinnati to Exit 4 with Interstate 74-U.S. 52 west and 27 north. Interstate 75 and U.S. 52 east overlap for a half mile to Camp Washington while the route west accompanies I-74 to Exit 169 in Braysville, Indiana. Photo taken 11/04/11. One half mile ahead of the directional T interchange (Exit 4) with Interstate 74 west on I-75 south. I-74 winds northwest from Cincinnati ten miles to merge with Interstate 275. Photo taken 11/04/11. Exit 4 departs Interstate 75 south along a sharp curve to join Interstate 74 west, which presently travels at grade below the adjacent railroad lines. Construction from 2017 to 2020 will replace this movement with a new high speed flyovers serving both I-74 west and U.S. 27 (Beekman Street) north to Northside. Photo taken 11/04/11. Replaced button copy signs on Interstate 74 south at the off-ramp (Exit 4) for Interstate 74-U.S. 52 west & U.S. 27 north. U.S. 127 travels around this interchange along Central Parkway from Northside south to Camp Washington while U.S. 27 & 52 use the freeway system. Photo taken by Don Hargraves (12/02). 2.25 miles south of the westbound beginning of Interstate 74 on I-75 north through the West End neighborhood. Construction included in the Mill Creek Expressway project through July 2017 rebuilds I-75 from the Western Hills Viaduct to Hopple Street. Photo taken 11/08/09. Exit 2 to Harrison Avenue departs from the left, 1.75 miles south of Interstate 74. The forthcoming Hopple Street off-ramp was shifted from the left to the right in 2015. Photo taken 11/08/09. This sign for Interstate 74 was still in use during construction in 2015. U.S. 27 north & 52 west merge onto I-75 north from Hopple Street to make the connection with I-74 west to South Cumminsville. All subsequent signs for I-74 were taken down due to the shift of traffic onto temporary configurations on the east side of Interstate 75. Photo taken 11/08/09. Original guide signs posted 2.25 miles south of the Interstate 74 eastern terminus on I-75 north. These were replaced by 2007. Photo taken by Steve Hanudel (08/20/05). Passing under the Western Hills Viaduct along Interstate 75 north. A loop ramp joined the freeway north from Harrison Avenue east, 1.5 miles south of the directional T interchange (Exit 4) with Interstate 74 & U.S. 52 west. Photo taken by Steve Hanudel (08/20/05). Four lanes of Interstate 75 north continued one half mile to the left-hand ramp for Hopple Street. Interstate 74 travels northwest to Indianapolis and is part of the most direct route to Chicago (with the latter half of the route via Interstate 65). Photo taken by Steve Hanudel (08/20/05). Directional ramps once connected Hopple Street east with I-75 north and from I-75 north to Hopple Street west. These were removed during the Mill Creek Expressway project. Button copy signs pictured here were replaced by 2007. Photo taken by Steve Hanudel (08/20/05). This sign bridge was posted along I-75 north between the Monmouth Avenue overpass and a former pedestrian bridge at Colerain Avenue. The northbound freeway saw a lane drop from four to three lanes at Exit 4 with Interstate 74. Photo taken 11/08/09. Two lanes partitioned from Interstate 75 north for I-74-U.S. 52 west & U.S. 27 north to Northside, Harrison and Indianapolis, Indiana. Travelers remaining along I-75 reached Dayton in another 47 miles. Photo taken by Steve Hanudel (08/20/05). Sign replacements made by 2007 at the westbound beginning of Interstate 74 on I-75 north. This view looked at very light traffic on a Sunday morning. Photo taken 11/08/09. Interstate 74 runs north between an apartment complex and the Lakehurst subdivision just north of 53rd Street. The final confirming shield for I-74 west stands along this stretch. Photo taken 05/26/18. A half mile guide sign for Interstate 80 was added to I-74 west ahead of Veterans Memorial Parkway following construction to expand the 53rd Street interchange (Exit 1). The ramps for I-80 are unnumbered. Photo taken 05/26/18. The original 67th Street overpass was replaced in 2015-16 as part of Bettendorf and Davenport city project to extend Veterans Memorial Parkway east to Utica Ridge Road. Overheads for the ramp separation to I-80 were carbon copied from the previous set of signs. Photo taken 05/26/18. The westbound lanes of Interstate 74 default onto I-80 west ahead of the cloverleaf interchange with U.S. 61 north and U.S. 61 Business (Brady Street) south. U.S. 61 links the Quad Cities with Dubuque while Interstate 80 ventures west along a busy trucking corridor to Iowa City and Des Moines. Photo taken 05/26/18. Construction from 2010 to November 2012 expanded the diamond interchange at 53rd Street with loop ramps to Interstate 74. The new ramp joining I-74 westbound took the place of this guide sign posted one mile south of the terminus at Interstate 80. Photo taken 09/04/05. Signs for the upcoming separation of traffic for Interstate 80 were attached to the original 67th Street overpass. This bridge was replaced in 2015 with the development of Veterans Memorial Parkway east from U.S. 61 Business (Brady Street) to Utica Ridge Road. Photo taken 09/04/05. Interstate 80 continues two miles east from the split with U.S. 61 north to meet Interstate 74 at a trumpet interchange (Exit 298). 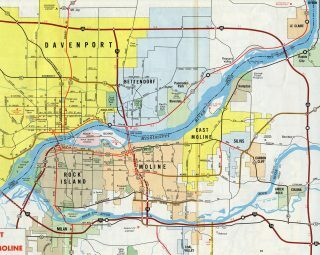 I-74 leads south to the Riverfront of both Davenport and Riverfront while I-80 stays to the north to Le Claire and Rapids City, Illinois. Photo taken 06/19/15. Yellow placards referencing Local Traffic were added to Exit 298 signs during the mid 2000s to redirect through traffic away from the Iowa Illinois Memorial Bridge. Expansion of the Mississippi River crossing to eight lanes by 2020 should alleviate these concerns. Photo taken 06/19/15. The rural junction between Interstates 74 and 80 at Exit 298 was targeted for area development, leading to construction of the Rhythm City Casino complex just to the southwest. Interstate 74 travels a short distance south to 53rd Street, which serves a busy retail corridor on parallel Elmore Avenue north toward the casino and south to U.S. 6 (Kimberly Road). Photo taken 05/26/18. Interstate 80 east at Interstate 74 (Exit 298) before the addition of signs for Local and Through traffic. Photo taken by Jim Teresco (07/01). Interstate 80 remains rural through northern reaches of Bettendorf to the Davenport city line and Exit 298 with Interstate 74 east. Photo taken 05/29/18. Utica Ridge Road spans Interstate 80 west, one mile ahead of the trumpet interchange (Exit 298) with Interstate 74 east. I-74 runs roughly along the Davenport city line to the Downtown area of Bettendorf at the Iowa-Illinois Memorial Bridge. Photo taken 04/08/13. Westbound I-80 at the loop ramp (Exit 298) for Interstate 74 east. 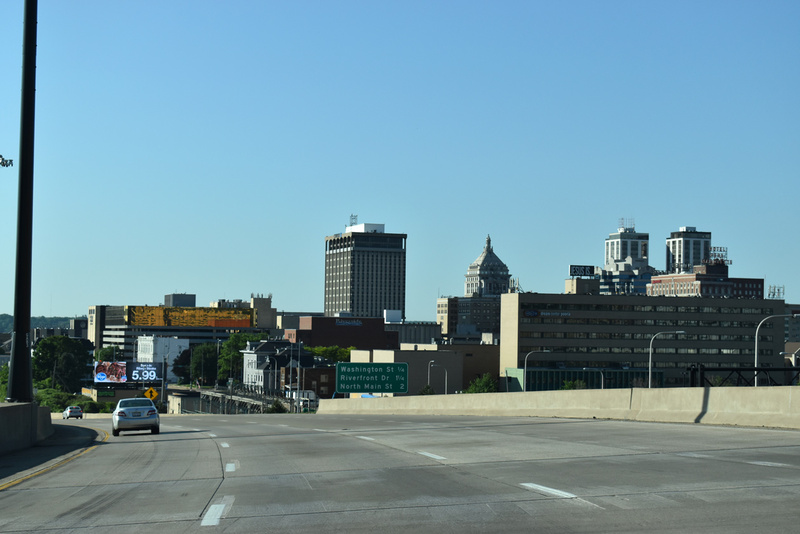 I-74 sees four exits on the Iowa side of the Quad Cities before crossing the Mississippi River into Downtown Moline, Illinois. Photo taken 04/08/13. The first reassurance marker for Interstate 74 appears at the Veterans Memorial Parkway overpass. Veterans Memorial Parkway constitutes an east-west arterial developed by the cities of Davenport and Bettendorf to open up additional areas for economic development. The original 67th Street overpass above I-74 was replaced during construction to build the parkway between 2013 and 2016. Photo taken 06/19/15. “Seeing progress for new I-74 bridge project.” The Dispatch / Rock Island Argus (QCOnline.com), March 25, 2015. “Building a Bridge: I-74 project moves into home stretch.” KWQC March 14, 2016. “Cause for celebration – Festival will mark historic I-74 construction and reopening of Murray Baker Bridge.” The Peoria Journal Star, September 29, 2005. “THE BIG FIX — First year at-a-glance.” Peoria Journal Star, The (IL), June 22, 2003. 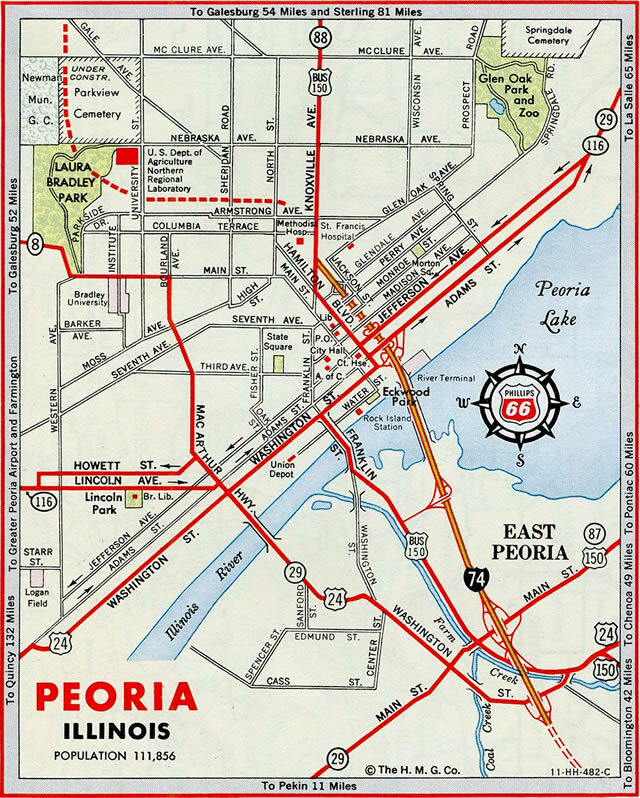 “Road to Change > When Interstate 74 Cut Through Peoria in the Late ’50s, The Drive Toward Future Growth Began. The Interstate’s Impact on the City Has Been Significant During the Past Four Decades, But Officials Today are Still Looking Toward the Future.” Journal Star (Peoria, IL), June 30, 1996. “Bridge is Link That Altered Face of a City > Span That Carries I-74 Across River was Key in Shaping a Greater Peoria.” Journal Star (Peoria, IL), December 12, 1998. “I-74: Inching to the finish – Some barrels remain, work zone speed limits still in effect while crews chip away on minor work, cleanup, landscaping.” Peoria Journal Star, The (IL), November 29, 2006. “I-74 part of celebration.” Paper of Montgomery County, The (Crawfordsville, IN), June 30, 2006. 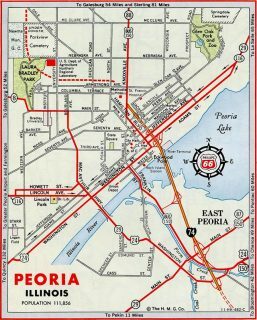 “Original a work in progress — ‘Illini Expressway’ unified Tri-County Area, fueled growth of Downtown Peoria.” Peoria Journal Star, The (IL), June 22, 2003. Page updated June 7, 2018.